Connecting with GQ , Ethan Hawke wears a coat, vest, and pants by Ralph Lauren. A Levi's Vintage Clothing t-shirt, Dsquared2 boots, BOSS beanie, and Cartier watch complete his look. 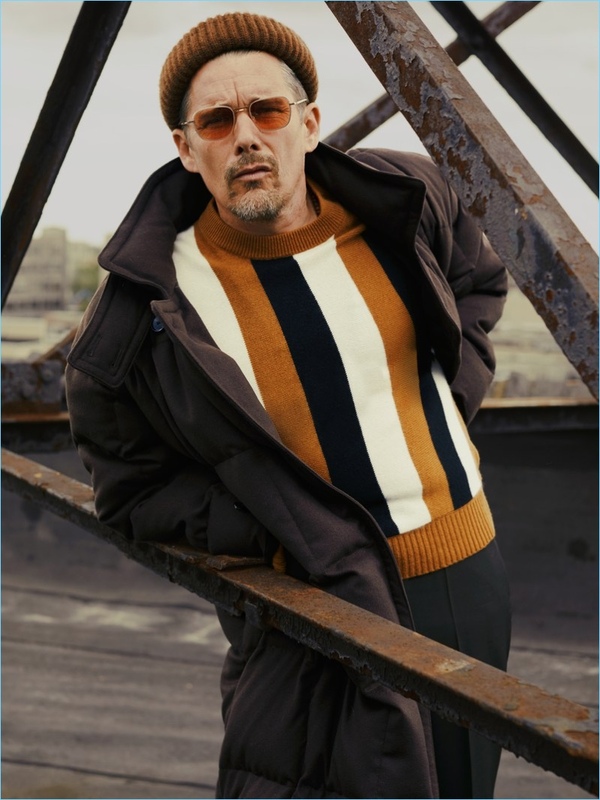 Ethan Hawke stars in a fall style shoot for the August 2018 issue of GQ . The celebrated actor connects with photographer Fanny Latour-Lambert for the occasion. Front and center, Hawke dons fashions from luxury labels such as Tom Ford and Ermenegildo Zegna Couture. 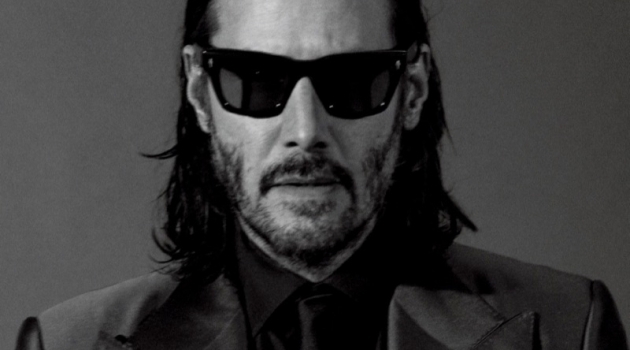 He also talks about his latest projects First Reformed and Juliet, Naked . Asked if he could give the same performance he delivers in First Reformed, ten years ago, Hawke easily answers. No. You ever hear the expression That actor has gravitas? When I was younger, that always sounded cool to me. Hawke continues, George C. Scott had gravitas. Gene Hackman had gravitas. What I didn't know is that to have it, you had to have gone through a lot of pain. [laughs] You've had enough success to know success isn't gonna make you happy, and you've had enough failure to know that that's even worse, and you know all the things that you're not going to be. And simultaneously, I'm becoming an adult, right? I mean, this should have happened a long time ago, but it's happened—I have four kids, I get asked to join boards, I get asked to teach. The universe is changing what it wants from me. 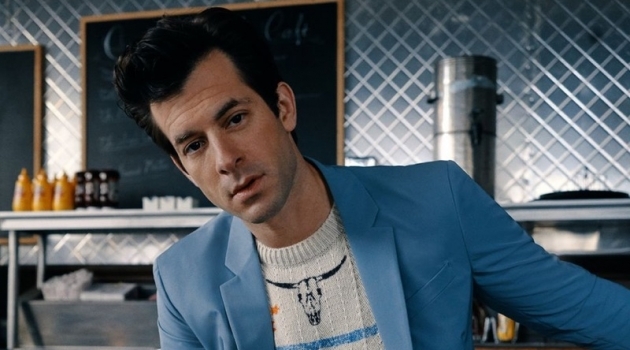 Read more at GQ.com. 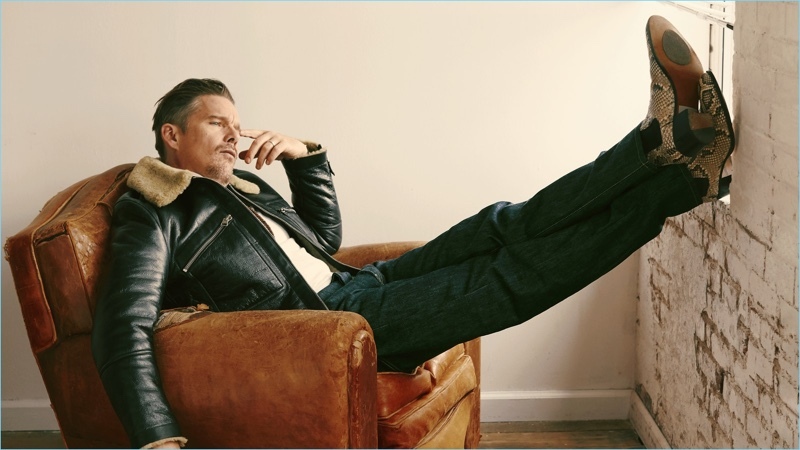 Ethan Hawke wears a leather Tom Ford jacket, Ermenegildo Zegna Couture turtleneck, and Levi's Vintage Clothing jeans. He sports Tom Ford boots as well. Stepping outside, Ethan Hawke wears a Billy Reid suit, Salvatore Ferragamo shirt, Giorgio Armani shoes, and Salt sunglasses. A cool vision, Ethan Hawke wears a BOSS coat, pants, and beanie. Hawke also rocks a Sandro sweater and Garrett Leight sunglasses. 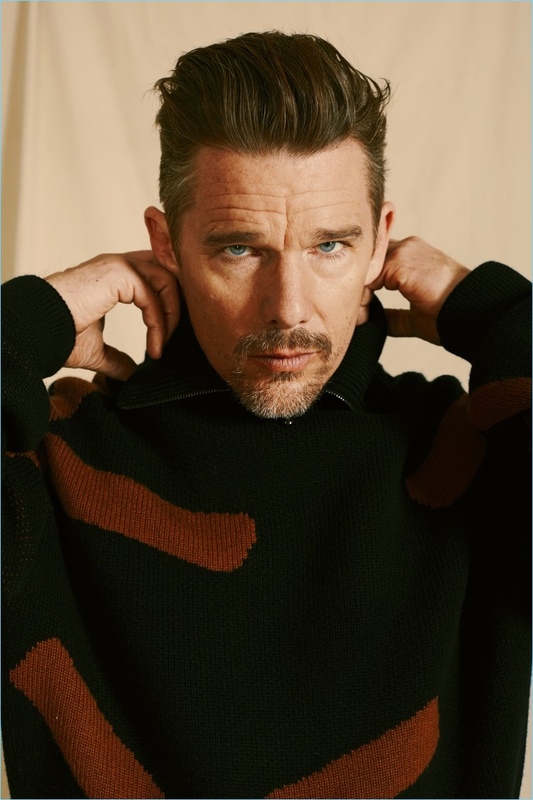 Starring in a photo shoot, Ethan Hawke dons an Ermenegildo Zegna Couture sweater.